Here's a little bit of genius, if I do say so myself. I had a pound of dried navy beans that I was looking to put to good use. I am working to come up with a good baked bean recipe, but I did not want to go that route. What to do? These days I always have a few quarter-pound packets of bacon ends in the freezer, so I thought about making a quick version of my Navy Bean and Bacon Soup. I had all of the ingredients so I set about cooking the beans. I always cook a pound of beans and then use half, freezing the rest. That way I get double duty out of them. But my freezer is, as usual, full to capacity and I started to think about what I might be able to take out in order to make more room for the beans. And I remembered some Sweet and Sour Cabbage Soup that I made with such a huge (cheap) head of cabbage that I had enough to freeze half and still worry about how I was going to eat the rest before it went bad. That was taking up a lot of room in the freezer, and I don't like to leave it in there too long, as the cabbage does get a little grainy when frozen. But that seemed a little too similar to the Navy Bean and Bacon Soup for me to have both on hand. And that's when genius struck. I recently started putting some kind of brats or sausage in the cabbage soup, but I didn't have any on hand and didn't feel like trekking down to the Apple Market to get some, so I had made a vegetarian version. What would happen if, instead of plain old tomatoes, I used the S&SC soup as the base for my new soup? The result was spectacular. 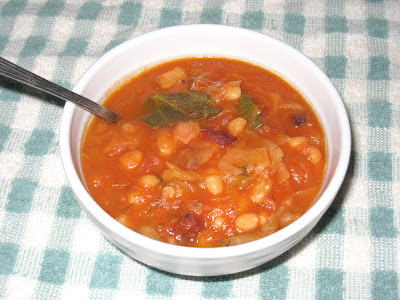 The cabbage soup adds a dimension of tartness that elevates the navy bean soup to a new depth of flavor, and the navy beans really thicken the cabbage soup. It would work just as well with brats or sausage, I think. In a world that was already blessed with two delicious soups, bringing them together has created a third variation that is truly divine. Cook bacon in heavy dutch oven over medium-high heat until it is well browned. Remove all but 1 to 2 tablespoons of the grease. Add the beans, cabbage soup, and tomatoes. Bring to a boil, reduce the heat and simmer for 10 to 15 minutes, until the flavors have come together. Season to taste, keeping the saltiness of the bacon in mind. *adjust amount of sweet and sour cabbage soup to achieve desired consistency.